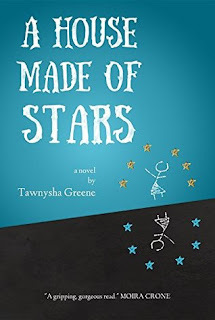 A House Made of Stars was a really difficult book to read. It was wonderfully written, but the subject matter was not easy to digest. It starts out with the Narrator and her sister being hidden in a shower with Momma as an "earthquake drill", which is a cover because Daddy is in a rage. Daddy has lost another job and they have to move. Unfortunately, the family ends up losing their security deposit due to the damage done to their apartment by an angry father so they end up moving in with Daddy's sister. As it turns out, Daddy and his sister were victims of abuse by their mother who had some mental health issues. The narrator's sister is deaf, and it seems Daddy has some hearing loss as well, but no one in the family is allowed to use sign language around Daddy because he doesn't like it. Daddy's sister enables his behavior by giving him money. Momma tries to get Daddy to get another job, but that doesn't seem to interest him. Even when Momma finds out she is pregnant, it doesn't motivate Daddy to find a job. We don't see the actual physical abuse of the narrator and her sister until almost halfway through the book. It's a horrifying scene and was very hard to read. Eventually, Grandma comes (Momma's mother) and takes Momma and the girls away. Daddy gets very angry and refuses to come. I don't want to give away the entire book since it is so short, but Grandma's house is only a temporary refuse for this broken family. There were several interesting things I found in this book. First of all, none of the characters were given names. The narrator doesn't even refer to her sister by her given name. Secondly, this 10 yo narrator never mentions seeing her father drinking alcohol. Often times alcohol and abuse go together so I wonder if these parents either kept it well hidden from their daughters, or if his mental illness was such that alcohol was not a component in his rages. And lastly, I did not like the mother's passive attitude toward her husband's abuse of their children. Especially as a woman who seemed to be such a devout Christian, she really seemed to be under some delusion as to how God would feel about a father treating his children this way. All of that just didn't sit right with me. I'm guessing that is part of what the author was trying to illustrate. For a debut novel, this was masterfully written. But it's hard to gush over a novel written about such a diffcult topic. I am happy that the narrator learned something by the end of the book and I feel like she will break the cycle of abuse for her next generation. This is a short novel, but not necessarily and "easy" read due to the subject matter. But definitely worth reading! She's only ten years old, but she knows something is wrong with her father. Her mother says he just needs time to rest, to clear his mind. They must never question him. They must never call the police.